And by its slow and crooked Course the Year. Which in their Turn for happy Ends appear. Still we the Fountain of their Motion trace. And leaves him with Attractive Force endu'd. Within his reach, are turn'd in Ether round. In Creation: A Philosophical Poem in Seven Books (1712), book 2, l. 430-53, p.78-9. The Charms of Statistics.—It is difficult to understand why statisticians commonly limit their inquiries to Averages, and do not revel in more comprehensive views. Their souls seem as dull to the charm of variety as that of the native of one of our flat English counties, whose retrospect of Switzerland was that, if its mountains could be thrown into its lakes, two nuisances would be got rid of at once. An Average is but a solitary fact, whereas if a single other fact be added to it, an entire Normal Scheme, which nearly corresponds to the observed one, starts potentially into existence. Some people hate the very name of statistics, but I find them full of beauty and interest. Whenever they are not brutalised, but delicately handled by the higher methods, and are warily interpreted, their power of dealing with complicated phenomena is extraordinary. They are the only tools by which an opening can be cut through the formidable thicket of difficulties that bars the path of those who pursue the Science of man. A conceptual scheme is never discarded merely because of a few stubborn facts with which it cannot be reconciled; a conceptual scheme is either modified or replaced by a better one, never abandoned with nothing left to take its place. Science and Common Sense (1951), 173. 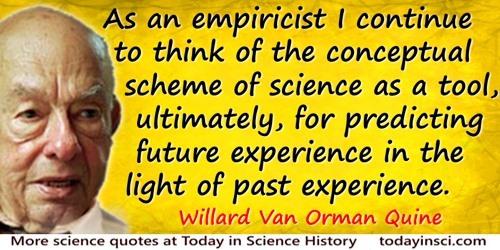 As an empiricist I continue to think of the conceptual scheme of science as a tool, ultimately, for predicting future experience in the light of past experience. Physical objects are conceptually imported into the situation as convenient intermediaries—not by definition in terms of experience, but simply as irreducible posits comparable, epistemologically, to the gods of Homer. For my part I do, qua lay physicist, believe in physical objects and not in Homer's gods; and I consider it a scientific error to believe otherwise. But in point of epistemological footing the physical objects and the gods differ only in degree and not in kind. Both sorts of entities enter our conception only as cultural posits. The myth of physical objects is epistemologically superior to most in that it has proved more efficacious than other myths as a device for working a manageable structure into the flux of experience. As chemists, we must rename [our] scheme and insert the symbols Ba, La, Ce in place of Ra, Ac, Th. As nuclear chemists closely associated with physics, we cannot yet convince ourselves to make this leap, which contradicts all previous experience in nuclear physics. '(Über den nachweis und das Verhalten der bei der Bestrahlung des Urans mittels Neutronen entstehenden Erdalkallmetalle', Die Naturwissenschaften, 1939, 27, 11-15. Trans. J. Heilbron and Robert W. Seidel, Lawrence and his Laboratory: A History of the Lawrence Berkeley Laboratory (1989), Vol. 1, 436-7. As geologists, we learn that it is not only the present condition of the globe that has been suited to the accommodation of myriads of living creatures, but that many former states also have been equally adapted to the organization and habits of prior races of beings. The disposition of the seas, continents, and islands, and the climates have varied; so it appears that the species have been changed, and yet they have all been so modelled, on types analogous to those of existing plants and animals, as to indicate throughout a perfect harmony of design and unity of purpose. To assume that the evidence of the beginning or end of so vast a scheme lies within the reach of our philosophical inquiries, or even of our speculations, appears to us inconsistent with a just estimate of the relations which subsist between the finite powers of man and the attributes of an Infinite and Eternal Being. Concluding remark, Principles of Geology(1833), Vol. 3, 384-5. But, as we consider the totality of similarly broad and fundamental aspects of life, we cannot defend division by two as a natural principle of objective order. Indeed, the ‘stuff’ of the universe often strikes our senses as complex and shaded continua, admittedly with faster and slower moments, and bigger and smaller steps, along the way. Nature does not dictate dualities, trinities, quarterings, or any ‘objective’ basis for human taxonomies; most of our chosen schemes, and our designated numbers of categories, record human choices from a cornucopia of possibilities offered by natural variation from place to place, and permitted by the flexibility of our mental capacities. How many seasons (if we wish to divide by seasons at all) does a year contain? How many stages shall we recognize in a human life? Can any thoughtful person admit for a moment that, in a society so constituted that these overwhelming contrasts of luxury and privation are looked upon as necessities, and are treated by the Legislature as matters with which it has practically nothing do, there is the smallest probability that we can deal successfully with such tremendous social problems as those which involve the marriage tie and the family relation as a means of promoting the physical and moral advancement of the race? What a mockery to still further whiten the sepulchre of society, in which is hidden ‘all manner of corruption,’ with schemes for the moral and physical advancement of the race! In 'Human Selection', Fortnightly Review (1890),48, 330. Common sense … may be thought of as a series of concepts and conceptual schemes which have proved highly satisfactory for the practical uses of mankind. Some of those concepts and conceptual schemes were carried over into science with only a little pruning and whittling and for a long time proved useful. As the recent revolutions in physics indicate, however, many errors can be made by failure to examine carefully just how common sense ideas should be defined in terms of what the experimenter plans to do. In Science and Common Sense (1951), 32-33. Connected by innumerable ties with abstract science, Physiology is yet in the most intimate relation with humanity; and by teaching us that law and order, and a definite scheme of development, regulate even the strangest and wildest manifestations of individual life, she prepares the student to look for a goal even amidst the erratic wanderings of mankind, and to believe that history offers something more than an entertaining chaos—a journal of a toilsome, tragi-comic march nowither. In 'Educational Value of Natural History Sciences', Lay Sermons, Addresses, and Reviews (1870), 97. Every intellectual revolution which has ever stirred humanity into greatness has been a passionate protest against inert ideas. Then, alas, with pathetic ignorance of human psychology, it has proceeded by some educational scheme to, bind humanity afresh with inert ideas of its own fashioning. In 'The Aims of Education', The Aims of Education and Other Essays (1929), 14. Every new theory as it arises believes in the flush of youth that it has the long sought goal; it sees no limits to its applicability, and believes that at last it is the fortunate theory to achieve the 'right' answer. This was true of electron theory—perhaps some readers will remember a book called The Electrical Theory of the Universe by de Tunzelman. It is true of general relativity theory with its belief that we can formulate a mathematical scheme that will extrapolate to all past and future time and the unfathomed depths of space. It has been true of wave mechanics, with its first enthusiastic claim a brief ten years ago that no problem had successfully resisted its attack provided the attack was properly made, and now the disillusionment of age when confronted by the problems of the proton and the neutron. When will we learn that logic, mathematics, physical theory, are all only inventions for formulating in compact and manageable form what we already know, like all inventions do not achieve complete success in accomplishing what they were designed to do, much less complete success in fields beyond the scope of the original design, and that our only justification for hoping to penetrate at all into the unknown with these inventions is our past experience that sometimes we have been fortunate enough to be able to push on a short distance by acquired momentum. The Nature of Physical Theory (1936), 136. How the Periodic Table was explained in a first-term university lecture to the central character in the novel by C.P. Snow, The Search (1935), 38. Half a century ago Oswald (1910) distinguished classicists and romanticists among the scientific investigators: the former being inclined to design schemes and to use consistently the deductions from working hypotheses; the latter being more fit for intuitive discoveries of functional relations between phenomena and therefore more able to open up new fields of study. Examples of both character types are Werner and Hutton. Werner was a real classicist. At the end of the eighteenth century he postulated the theory of “neptunism,” according to which all rocks including granites, were deposited in primeval seas. It was an artificial scheme, but, as a classification system, it worked quite satisfactorily at the time. Hutton, his contemporary and opponent, was more a romanticist. His concept of “plutonism” supposed continually recurrent circuits of matter, which like gigantic paddle wheels raise material from various depths of the earth and carry it off again. This is a very flexible system which opens the mind to accept the possible occurrence in the course of time of a great variety of interrelated plutonic and tectonic processes. In 'The Scientific Character of Geology', The Journal of Geology (Jul 1961), 69, No. 4, 456-7. I am concerned at the over-enthusiasm of unbridled reformers who initiate costly and frequently useless or even dangerous schemes. Progress is not synonymous with radicalism. In 'Myre Sim', Gale, Contemporary Authors Online (2002). I do not see any reason to assume that the heuristic significance of the principle of general relativity is restricted to gravitation and that the rest of physics can be dealt with separately on the basis of special relativity, with the hope that later on the whole may be fitted consistently into a general relativistic scheme. I do not think that such an attitude, although historically understandable, can be objectively justified. The comparative smallness of what we know today as gravitational effects is not a conclusive reason for ignoring the principle of general relativity in theoretical investigations of a fundamental character. In other words, I do not believe that it is justifiable to ask: What would physics look like without gravitation? I don't really care how time is reckoned so long as there is some agreement about it, but I object to being told that I am saving daylight when my reason tells me that I am doing nothing of the kind. I even object to the implication that I am wasting something valuable if I stay in bed after the sun has risen. As an admirer of moonlight I resent the bossy insistence of those who want to reduce my time for enjoying it. At the back of the Daylight Saving scheme I detect the bony, blue-fingered hand of Puritanism, eager to push people into bed earlier, and get them up earlier, to make them healthy, wealthy and wise in spite of themselves. In The Diary of Samuel Marchbanks (1947), 75. I learnt to distrust all physical concepts as the basis for a theory. Instead one should put one's trust in a mathematical scheme, even if the scheme does not appear at first sight to be connected with physics. One should concentrate on getting interesting mathematics. From a 1977 lecture. Quoted in Pesi Rustom Masani, Norbert Wiener, 1894-1964 (1990), 6. I strongly reject any conceptual scheme that places our options on a line, and holds that the only alternative to a pair of extreme positions lies somewhere between them. More fruitful perspectives often require that we step off the line to a site outside the dichotomy. I wasn’t aware of Chargaff’s rules when he said them, but the effect on me was quite electric because I realized immediately that if you had this sort of scheme that John Griffith was proposing, of adenine being paired with thymine, and guanine being paired with cytosine, then you should get Chargaff’s rules. I was very excited, but I didn’t actually tell Chargaff because it was something I was doing with John Griffith. There was a sort of musical comedy effect where I forgot what the bases were and I had to go to the library to check, and I went back to John Griffith to find out which places he said. Low and behold, it turned out that John Griffith’s ideas fitted in with Chargaff’s rules! This was very exciting, and we thought “ah ha!” and we realized—I mean what anyone who is familiar with the history of science ought to realize—that when you have one-to-one ratios, it means things go to together. And how on Earth no one pointed out this simple fact in those years, I don’t know. In place of infinity we usually put some really big number, like 15. Perhaps referring to the programmer’s hexadecimal counting scheme which has 16 digits (0-9 followed by digits A-F), useful in binary context as a power of 2. Attributed to a Computer Science Professor on various web pages. Webmaster has found no print source for this wording and comments, but its originality makes it worthy of inclusion here. Webmaster comments: perhaps one of those infinite number of monkeys typed it! Please make contact if you know a primary print source. In the school of political projectors, I was but ill entertained, the professors appearing, in my judgment, wholly out of their senses; which is a scene that never fails to make me melancholy. These unhappy people were proposing schemes for persuading monarchs to choose favourites upon the score of their wisdom, capacity, and virtue; of teaching ministers to consult the public good; of rewarding merit, great abilities, and eminent services; of instructing princes to know their true interest, by placing it on the same foundation with that of their people; of choosing for employment persons qualified to exercise them; with many other wild impossible chimeras, that never entered before into the heart of man to conceive, and confirmed in me the old observation, that there is nothing so extravagant and irrational which some philosophers have not maintained for truth. Gulliver's Travels (1726, Penguin ed. 1967), Part III, Chap. 6, 232. It is a vulgar belief that our astronomical knowledge dates only from the recent century when it was rescued from the monks who imprisoned Galileo; but Hipparchus … who among other achievements discovered the precession of the eqinoxes, ranks with the Newtons and the Keplers; and Copernicus, the modern father of our celestial science, avows himself, in his famous work, as only the champion of Pythagoras, whose system he enforces and illustrates. Even the most modish schemes of the day on the origin of things, which captivate as much by their novelty as their truth, may find their precursors in ancient sages, and after a careful analysis of the blended elements of imagination and induction which charaterise the new theories, they will be found mainly to rest on the atom of Epicurus and the monad of Thales. Scientific, like spiritual truth, has ever from the beginning been descending from heaven to man. It is an astonishing feat of deciphering that we should have been able to infer an orderly scheme of natural knowledge from such indirect communication. Swarthmore Lecture (1929) at Friends’ House, London, printed in Science and the Unseen World (1929), 34. It is not surprising that our language should be incapable of describing the processes occurring within the atoms, for, as has been remarked, it was invented to describe the experiences of daily life, and these consists only of processes involving exceedingly large numbers of atoms. Furthermore, it is very difficult to modify our language so that it will be able to describe these atomic processes, for words can only describe things of which we can form mental pictures, and this ability, too, is a result of daily experience. Fortunately, mathematics is not subject to this limitation, and it has been possible to invent a mathematical scheme—the quantum theory—which seems entirely adequate for the treatment of atomic processes; for visualization, however, we must content ourselves with two incomplete analogies—the wave picture and the corpuscular picture. The Physical Principles of the Quantum Theory, trans. Carl Eckart and Frank C. Hoyt (1949), 11. It is not therefore the business of philosophy, in our present situation in the universe, to attempt to take in at once, in one view, the whole scheme of nature; but to extend, with great care and circumspection, our knowledge, by just steps, from sensible things, as far as our observations or reasonings from them will carry us, in our enquiries concerning either the greater motions and operations of nature, or her more subtile and hidden works. In this way Sir Isaac Newton proceeded in his discoveries. An Account of Sir Isaac Newton's Philosophical Discoveries, in Four Books (1748), 19. 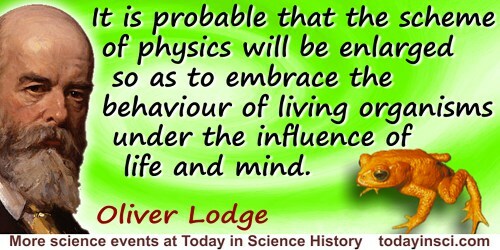 It is probable that the scheme of physics will be enlarged so as to embrace the behaviour of living organisms under the influence of life and mind. Biology and psychology are not alien sciences; their operations are not solely mechanical, nor can they be formulated by physics as it is today; but they belong to a physical universe, and their mode of action ought to be capable of being formulated in terms of an enlarged physics in the future, in which the ether will take a predominant place. On the other hand it may be thought that those entities cannot be brought to book so easily, and that they will always elude our ken. If so, there will be a dualism in the universe, which posterity will find staggering, but that will not alter the facts. In Past Years: an Autobiography (1932), 350. Quoted in book review, Waldehar Kaempfert, 'Sir Oliver Lodge Stands by the Old Physics', New York Times (21 Feb 1932), BR5. It was to Hofmeister, working as a young man, an amateur and enthusiast, in the early morning hours of summer months, before business, at Leipzig in the years before 1851, that the vision first appeared of a common type of Life-Cycle, running through Mosses and Ferns to Gymnosperms and Flowering Plants, linking the whole series in one scheme of reproduction and life-history. (1919). 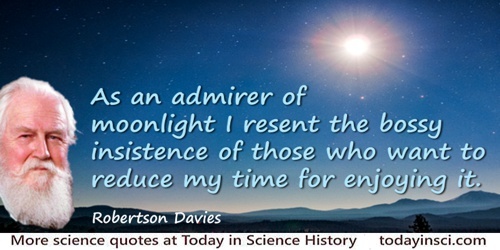 As quoted in E.J.H. Corner, The Life of Plants (1964). Just as the introduction of the irrational numbers … is a convenient myth [which] simplifies the laws of arithmetic … so physical objects are postulated entities which round out and simplify our account of the flux of existence… The conceptional scheme of physical objects is [likewise] a convenient myth, simpler than the literal truth and yet containing that literal truth as a scattered part. In J. Koenderink Solid Shape (1990. ), 16. Let us now discuss the extent of the mathematical quality in Nature. According to the mechanistic scheme of physics or to its relativistic modification, one needs for the complete description of the universe not merely a complete system of equations of motion, but also a complete set of initial conditions, and it is only to the former of these that mathematical theories apply. The latter are considered to be not amenable to theoretical treatment and to be determinable only from observation. From Lecture delivered on presentation of the James Scott prize, (6 Feb 1939), 'The Relation Between Mathematics And Physics', printed in Proceedings of the Royal Society of Edinburgh (1938-1939), 59, Part 2, 125. In Science and Common Sense (1951), 25. Natural law is not applicable to the unseen world behind the symbols, because it is unadapted to anything except symbols, and its perfection is a perfection of symbolic linkage. You cannot apply such a scheme to the parts of our personality which are not measurable by symbols any more than you can extract the square root of a sonnet. Swarthmore Lecture (1929) at Friends’ House, London, printed in Science and the Unseen World (1929), 53. One feature which will probably most impress the mathematician accustomed to the rapidity and directness secured by the generality of modern methods is the deliberation with which Archimedes approaches the solution of any one of his main problems. Yet this very characteristic, with its incidental effects, is calculated to excite the more admiration because the method suggests the tactics of some great strategist who foresees everything, eliminates everything not immediately conducive to the execution of his plan, masters every position in its order, and then suddenly (when the very elaboration of the scheme has almost obscured, in the mind of the spectator, its ultimate object) strikes the final blow. Thus we read in Archimedes proposition after proposition the bearing of which is not immediately obvious but which we find infallibly used later on; and we are led by such easy stages that the difficulties of the original problem, as presented at the outset, are scarcely appreciated. As Plutarch says: “It is not possible to find in geometry more difficult and troublesome questions, or more simple and lucid explanations.” But it is decidedly a rhetorical exaggeration when Plutarch goes on to say that we are deceived by the easiness of the successive steps into the belief that anyone could have discovered them for himself. On the contrary, the studied simplicity and the perfect finish of the treatises involve at the same time an element of mystery. Though each step depends on the preceding ones, we are left in the dark as to how they were suggested to Archimedes. There is, in fact, much truth in a remark by Wallis to the effect that he seems “as it were of set purpose to have covered up the traces of his investigation as if he had grudged posterity the secret of his method of inquiry while he wished to extort from them assent to his results.” Wallis adds with equal reason that not only Archimedes but nearly all the ancients so hid away from posterity their method of Analysis (though it is certain that they had one) that more modern mathematicians found it easier to invent a new Analysis than to seek out the old. In The Works of Archimedes (1897), Preface, vi. One of the petty ideas of philosophers is to elaborate a classification, a hierarchy of sciences. They all try it, and they are generally so fond of their favorite scheme that they are prone to attach an absurd importance to it. We must not let ourselves be misled by this. Classifications are always artificial; none more than this, however. There is nothing of value to get out of a classification of science; it dissembles more beauty and order than it can possibly reveal. In 'The Teaching of the History of Science', The Scientific Monthly (Sep 1918), 194. Modern Science and Modern Man, p. 62, New York (1952). Letter to M.S.A. Ruyssenaers, Consul-General for Holland in Egypt, from Paris (8 Jul 1852), seeking support. Collected in Ferdinand de Lesseps, The Suez Canal: Letters and Documents Descriptive of Its Rise and Progress in 1854-1856 (1876), 2. Surely the claim of mathematics to take a place among the liberal arts must now be admitted as fully made good. Whether we look at the advances made in modern geometry, in modern integral calculus, or in modern algebra, in each of these three a free handling of the material employed is now possible, and an almost unlimited scope is left to the regulated play of fancy. It seems to me that the whole of aesthetic (so far as at present revealed) may be regarded as a scheme having four centres, which may be treated as the four apices of a tetrahedron, namely Epic, Music, Plastic, and Mathematic. There will be found a common plane to every three of these, outside of which lies the fourth; and through every two may be drawn a common axis opposite to the axis passing through the other two. So far is certain and demonstrable. I think it also possible that there is a centre of gravity to each set of three, and that the line joining each such centre with the outside apex will intersect in a common point the centre of gravity of the whole body of aesthetic; but what that centre is or must be I have not had time to think out. In 'Proof of the Hitherto Undemonstrated Fundamental Theorem of Invariants', Collected Mathematical Papers (1909), Vol. 3, 123. Technocrats are turning us into daredevils. The haphazard gambles they are imposing on us too often jeopardize our safety for goals that do not advance the human cause but undermine it. By staking our lives on their schemes, decision makers are not meeting the mandate of a democratic society; they are betraying it. They are not ennobling us; they are victimizing us. And, in acquiescing to risks that have resulted in irreversible damage to the environment, we ourselves are not only forfeiting our own rights as citizens. We are, in turn, victimizing the ultimate nonvolunteers: the defenseless, voiceless—voteless—children of the future. In Jacques Cousteau and Susan Schiefelbein, The Human, the Orchid, and the Octopus: Exploring and Conserving Our Natural World (2007), 85. The Greeks in the first vigour of their pursuit of mathematical truth, at the time of Plato and soon after, had by no means confined themselves to those propositions which had a visible bearing on the phenomena of nature; but had followed out many beautiful trains of research concerning various kinds of figures, for the sake of their beauty alone; as for instance in their doctrine of Conic Sections, of which curves they had discovered all the principal properties. But it is curious to remark, that these investigations, thus pursued at first as mere matters of curiosity and intellectual gratification, were destined, two thousand years later, to play a very important part in establishing that system of celestial motions which succeeded the Platonic scheme of cycles and epicycles. If the properties of conic sections had not been demonstrated by the Greeks and thus rendered familiar to the mathematicians of succeeding ages, Kepler would probably not have been able to discover those laws respecting the orbits and motions of planets which were the occasion of the greatest revolution that ever happened in the history of science. In History of Scientific Ideas, Bk. 9, chap. 14, sect. 3. The mathematician is entirely free, within the limits of his imagination, to construct what worlds he pleases. What he is to imagine is a matter for his own caprice; he is not thereby discovering the fundamental principles of the universe nor becoming acquainted with the ideas of God. If he can find, in experience, sets of entities which obey the same logical scheme as his mathematical entities, then he has applied his mathematics to the external world; he has created a branch of science. Aspects of Science: Second Series (1926), 92. The plain fact is that education is itself a form of propaganda–a deliberate scheme to outfit the pupil, not with the capacity to weigh ideas, but with a simple appetite for gulping ideas readymade. The aim is to make ‘good’ citizens, which is to say, docile and uninquisitive citizens. The reciprocal relationship of epistemology and science is of noteworthy kind. They are dependent on each other. Epistemology without contact with science becomes an empty scheme. Science without epistemology is–insofar as it is thinkable at all–primitive and muddled. In Ralph Keyesr, The Quote Verifier, 51-52. The safest general characterization of the European philosophical tradition is that it consists of a series of footnotes to Plato. I do not mean the systematic scheme of thought which scholars have doubtfully extracted from his writings. I allude to the wealth of general ideas scattered through them. In Process and Reality (1929), 39. The steady progress of physics requires for its theoretical formulation a mathematics which get continually more advanced. ... it was expected that mathematics would get more and more complicated, but would rest on a permanent basis of axioms and definitions, while actually the modern physical developments have required a mathematics that continually shifts its foundation and gets more abstract. Non-euclidean geometry and noncommutative algebra, which were at one time were considered to be purely fictions of the mind and pastimes of logical thinkers, have now been found to be very necessary for the description of general facts of the physical world. It seems likely that this process of increasing abstraction will continue in the future and the advance in physics is to be associated with continual modification and generalisation of the axioms at the base of mathematics rather than with a logical development of any one mathematical scheme on a fixed foundation. Introduction to a paper on magnetic monopoles, 'Quantised singularities in the electromagnetic field', Proceedings of the Royal Society of Lonndon (1931), A, 133 60. In Helge Kragh, Dirac: a Scientific Biography (1990), 208. The world of ideas which it [mathematics] discloses or illuminates, the contemplation of divine beauty and order which it induces, the harmonious connexion of its parts, the infinite hierarchy and absolute evidence of the truths with which it is concerned, these, and such like, are the surest grounds of the title of mathematics to human regard, and would remain unimpeached and unimpaired were the plan of the universe unrolled like a map at our feet, and the mind of man qualified to take in the whole scheme of creation at a glance. In Presidential Address to British Association (19 Aug 1869), 'A Plea for the Mathematician', published in Nature (6 Jan 1870), 1, 262. Collected in Collected Mathematical Papers (1908), Vol. 2, 659. There is nothing distinctively scientific about the hypothetico-deductive process. It is not even distinctively intellectual. It is merely a scientific context for a much more general stratagem that underlies almost all regulative processes or processes of continuous control, namely feedback, the control of performance by the consequences of the act performed. In the hypothetico-deductive scheme the inferences we draw from a hypothesis are, in a sense, its logical output. If they are true, the hypothesis need not be altered, but correction is obligatory if they are false. The continuous feedback from inference to hypothesis is implicit in Whewell’s account of scientific method; he would not have dissented from the view that scientific behaviour can be classified as appropriately under cybernetics as under logic. Induction and Intuition in Scientific Thought (1969), 54-5. These changes—the more rapid pulse, the deeper breathing, the increase of sugar in the blood, the secretion from the adrenal glands—were very diverse and seemed unrelated. Then, one wakeful night, after a considerable collection of these changes had been disclosed, the idea flashed through my mind that they could be nicely integrated if conceived as bodily preparations for supreme effort in flight or in fighting. Further investigation added to the collection and confirmed the general scheme suggested by the hunch. The Way of an Investigator: A Scientist's Experiences in Medical Research (1945), 59-60. This relation logical implication is probably the most rigorous and powerful of all the intellectual enterprises of man. From a properly selected set of the vast number of prepositional functions a set can be selected from which an infinitude of prepositional functions can be implied. In this sense all postulational thinking is mathematics. It can be shown that doctrines in the sciences, natural and social, in history, in jurisprudence and in ethics are constructed on the postulational thinking scheme and to that extent are mathematical. Together the proper enterprise of Science and the enterprise of Mathematics embrace the whole knowledge-seeking activity of mankind, whereby “knowledge” is meant the kind of knowledge that admits of being made articulate in the form of propositions. In Mathematics as a Culture Clue: And Other Essays (1947), 127. The Physical Principles of the Quantum Theory, trans. Carl Eckart and Frank C. Hoyt (1949), 58. Time, which measures everything in our idea, and is often deficient to our schemes, is to nature endless and as nothing; it cannot limit that by which alone it had existence; and as the natural course of time, which to us seems infinite, cannot be bounded by any operation that may have an end, the progress of things upon this globe, that is, the course of nature, cannot be limited by time, which must proceed in a continual succession. 'Theory of the Earth', Transactions of the Royal Society of Edinburgh (1788), 1, 215. To discover a Conception of the mind which will justly represent a train of observed facts is, in some measure, a process of conjecture, ... and the business of conjecture is commonly conducted by calling up before our minds several suppositions, selecting that one which most agrees with what we know of the observed facts. Hence he who has to discover the laws of nature may have to invent many suppositions before he hits upon the right one; and among the endowments which lead to his success, we must reckon that fertility of invention which ministers to him such imaginary schemes, till at last he finds the one which conforms to the true order of nature. Philosophy of the Inductive Sciences (1847), Vol. 2, 54. We should first look at the evidence that DNA itself is not the direct template that orders amino acid sequences. Instead, the genetic information of DNA is transferred to another class of molecules which then serve as the protein templates. These intermediate templates are molecules of ribonucleic acid (RNA), large polymeric molecules chemically very similar to DNA. Their relation to DNA and protein is usually summarized by the central dogma, a How scheme for genetic information first proposed some twenty years ago. In Molecular Biology of the Gene (1965), 281-282. As expressed in Adam Macqueen, The King of Sunlight: How William Lever Cleaned Up the World (2005), and in some of its book reviews. You may object that by speaking of simplicity and beauty I am introducing aesthetic criteria of truth, and I frankly admit that I am strongly attracted by the simplicity and beauty of mathematical schemes which nature presents us. You must have felt this too: the almost frightening simplicity and wholeness of the relationship, which nature suddenly spreads out before us. Letter to Albert Einstein. In Ian Stewart, Why Beauty is Truth (), 278. [The body of law] has taxed the deliberative spirit of ages. The great minds of the earth have done it homage. It was the fruit of experience. Under it men prospered, all the arts flourished, and society stood firm. Every right and duty could be understood because the rules regulating each had their foundation in reason, in the nature and fitness of things; were adapted to the wants of our race, were addressed to the mind and to the heart; were like so many scraps of logic articulate with demonstration. Legislation, it is true occasionally lent its aid, but not in the pride of opinion, not by devising schemes inexpedient and untried, but in a deferential spirit, as a subordinate co-worker. From biographical preface by T. Bigelow to Austin Abbott (ed. ), Official Report of the Trial of Henry Ward Beecher (1875), Vol. 1, xii. [There is] some mathematical quality in Nature, a quality which the casual observer of Nature would not suspect, but which nevertheless plays an important role in Nature’s scheme. From Lecture delivered on presentation of the James Scott prize, (6 Feb 1939), 'The Relation Between Mathematics And Physics', printed in Proceedings of the Royal Society of Edinburgh (1938-1939), 59, Part 2, 122.